At midnight of 22 June 1941, nothing was amiss in Kyiv. The weather that Sunday was supposed to be perfect – warm, sunny, and windless. The city’s football fans had been bustling with anticipation, as Dynamo Kyiv were set to face CDKA Moscow for the grand opening of the spectacular Republican Stadium. There was nothing to suggest that war was coming. But on 22 June, normalcy was shattered. It was the day of Nazi Germany’s invasion of the Soviet Union, opening up the most brutal front of the most devastating conflict in human history. There was to be no grand opening. Dynamo Kyiv were founded in 1927 and took part in the inaugural season of the Soviet Vysshaya Liga in 1936. They finished second, but by the 1939 season had slipped to eighth. In an effort to reverse their fortunes and challenge the hegemony of the Moscow clubs for the title, the club brought in manager Mikhail Butusov. The former Soviet international had led Dinamo Tbilisi to a second-place finish in 1939. In his first season at the helm, however, Butusov was unable to improve on Dynamo’s disappointing campaign, as they again finished eighth. Dynamo’s home ground in this period was the Dynamo Stadium, now named after legendary manager Valeriy Lobanovskiy. The Dynamo Stadium had a capacity of approximately 17,000. The city’s other main sporting venue, the Red Stadium, was shoddily constructed and incapable of adequately hosting large-scale events. In 1934 the capital of the Ukrainian SSR was moved from Kharkiv to Kyiv, and the city needed a more glamorous arena. Construction took a monumental effort. Tens of thousands of workers, equipped with the most modern technology available, spent five long years on the task. It was far more than a football venue. The athletic complex included areas for other sports like tennis, volleyball, and basketball. A running track surrounded the pitch. The modern facilities included changing rooms, dedicated rooms for referees, and a medical area. Even a hotel was integrated into the design. The stadium could seat 70,000 spectators. It was a marvel of modern architecture and a testament to the Soviet Union’s rapid development as an industrial power. As the 1941 season began, construction was inching toward completion. On the pitch, Dynamo continued their inconsistency. After winning four of their first six matches, they proceeded to collect only one point from their next three. A third of the way through the season they were in eighth place, mired in the now-familiar territory of midtable. Nevertheless, this was only five points behind leaders Dinamo Moscow, so a title challenge was still possible. The next match at home against CDKA, the day of the grand opening, presented an opportunity to get their campaign back on track. The visitors from Moscow were in sixth, just one point clear of their hosts. On the eve of the match, Proletarian Pravda wrote: “according to the masters of sport [a Soviet title for accomplished athletes] the new Republican stadium is one of the best in the country.” A journalist for Sovetskaya Ukraina went a step further, calling it the best in all of Europe. Final preparations were made. Communist flags and portraits of party leaders decorated the terraces. The ticket booths were open, advertisements for the event were everywhere. The city eagerly awaited the occasion. The first German bombs fell on Kyiv at four in the morning. According to official figures, 25 people were killed and 76 wounded. The actual casualties were likely much higher. The Great Patriotic War had officially begun. Of course, this was not the Soviet Union’s entrance into World War II. It had already invaded and occupied Poland and the Baltic states and fought a bitter war with Finland. But these battles were fought on foreign soil. On the home front, everything remained quiet – until the early hours of 22 June. Despite the initial attack, a strange sense of calm endured in Kyiv — the first bombs had only hit the outskirts, leaving the city centre untouched, and no one could truly comprehend the gravity of the moment. Heorhiy Kireev, an army captain whose unit was based in the city, later remembered: “We were worried that the war would end in two-three weeks and we would not have time to fight, so thoroughly had we been instilled with propaganda.” It lasted 1,418 days. With the official announcement of war, the match was called off. Technically the grand opening was never cancelled, only “postponed until victory.” The radio and posters around the city announced that tickets for the match would still be honoured, after the war. Butusov told his players that they could return home, but that he still expected them at training the following day. They turned up as planned, but it was the last time the Dynamo squad were together. 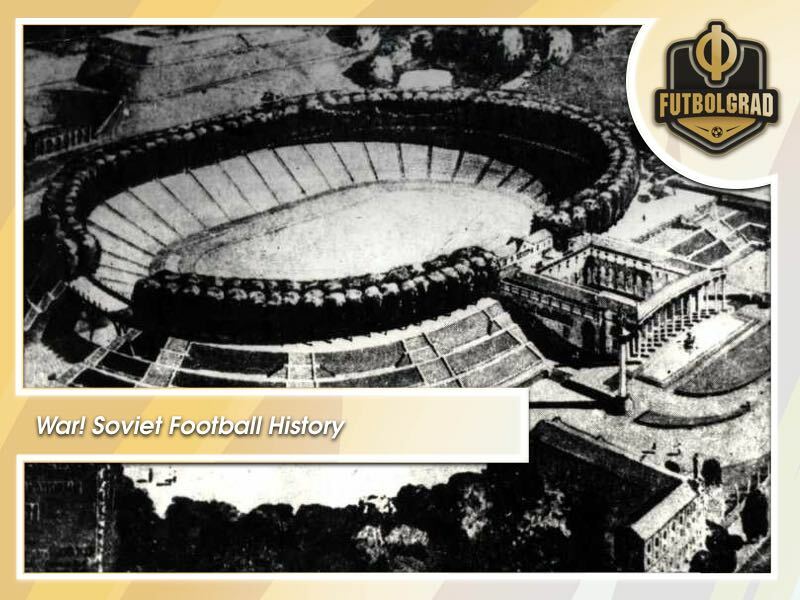 The outbreak of war interrupted the football season throughout the Soviet Union. On 22 June two matches were cancelled in Leningrad, which was also bombed that day. A bomb even hit the centre of the Zenit Stadium. The next day a match was called off in Minsk. The rumblings of artillery could already be heard in the capital of the Belarusian SSR. But on 24 June two matches took place. Traktor Stalingrad defeated Stakhanovets Stalino 3-2 away, and Dinamo Tbilisi recorded a victory at home over Dinamo Leningrad with the same score-line. Dinamo Leningrad’s train was bombed on their return trip home. The next day the newspaper Krasniy Sport published the league table, under which it simply said: “the championship is postponed.” The postponement, however, soon became permanent, a the Soviet Top League was cancelled for the next four years. Football continued on wartime Kyiv between the occupying armies and what remained of the population, including some former Dynamo players. Many of them joined local teams such as FC Rukh and FC Start. The latter side took part in the infamous Death Match against a Nazi team at the Zenit Stadium, located five kilometres to the northwest of the Republican Stadium. Several of them were murdered at the notorious Syrets concentration camp. Kyiv was liberated in November of 1943. 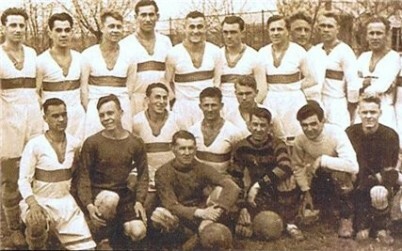 On 2 May 1944 Dynamo played a friendly against Spartak Moscow at the old Dynamo stadium. Only seven players from the pre-war side of 1941 were in the squad. Three years and three days after it was originally scheduled, the grand opening of the Republican Stadium finally took place on 25 June 1944. Those fortunate souls that survived the war and held on to their tickets were granted free entry – as promised, the original tickets were honoured. Dynamo lost 4-0, but the result was irrelevant compared to the symbolic significance of the occasion. Laevskiy never did make his first-team debut for Dynamo Kyiv. He was conscripted in 1943 and took part in the famous storming of the Reichstag by Soviet troops in the dying days of the war. The Soviets took the liberty of filling the Reichstag walls with graffiti. Laevskiy’s simple contribution was ‘Dynamo Kyiv.’ He may never have played for his hometown club, but he entered Dynamo lore in his own way. Tickets purchased for the original opening date were still honoured when the facility officially opened in 1944. A number of players managed to return to top-flight football, either back in Dynamo or elsewhere. Pavlo Vinkovatov became the club captain in 1948 and played until 1955. The decorated veteran Mykola Makhiniya became player-manager after the war. The Republican Stadium, heavily damaged during the war, was again rebuilt and later underwent several modernisations. At its peak capacity from 1967-1999, it held over 100,000 people. During Dynamo’s glory years ranging from the 1970s through the 1990s, it regularly sold out. Throughout its history, it has hosted many famous Dynamo victories, among them a 2-0 defeat of Bayern Munich in the 1975 UEFA Super Cup in front of 105,000 supporters. After several name changes, it acquired its current name, the Olympic National Sports Complex (known as NSC Olimpiyskiy in Ukrainian), in 1996. The stadium was most recently renovated in 2011, in preparation for Euro 2012. The NSC Olimpiyskiy was also the venue for the final of Euro 2012 and the 2018 Champions League Final and continues to be used as Dynamo’s home ground. But the most poignant, dramatic moment in the long history of this legendary football ground remains the match that was never played on that fateful day, 22 June 1941. Vadim Furmanov is a first-year student at the Duke University School of Law. Originally from Ukraine, Vadim has resided in Chicago since 1994 (though currently temporarily relocated to North Carolina) and is a passionate supporter of both Dynamo Kyiv and the Ukrainian national team. He writes primarily about Ukrainian football, as well as the intersection between football, politics, and history. You can follow Vadim on Twitter @vfurmanov.